Today, two different people contacted me who were diagnosed with Parkinson’s in the last few weeks. They are both shell-shocked by their diagnosis. One of them said she is about 20% Parkinson’s and 80% fear at this point. We have all been there. Most people tend to retreat after their diagnosis. They don’t know where to turn; they do their best to hide the disease from others and from themselves. Those with hand tremors try to hide their tremors by putting the hand in a pocket or holding it with their other hand. As one Parkie friend says, they are doing “the hand thing” to convince everyone that they are ok. So what’s a Parkie to do? One thing both of these women said was a priority was finding a way to get past the fear. Finding a welcoming Parkinsons community is an important key to moving on and learning to cope with the disease. This probably holds true for any chronic disease. Last year a woman was referred to me by a mutual friend. 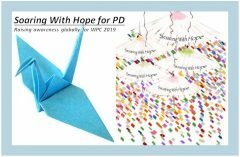 Before then, she had never even met another person with PD and she was afraid to come to the first meeting of a newly formed “women with PD” group we were starting. We met privately after the meeting and she was surprised to see that none of us fit her own PD image bent over and shuffling old people. We were all active and “normal” despite our various issues and limitations. Encouraged, she came to our next meeting and is now one of the most dedicated members. And she learned an important lesson: Stereotypes don’t apply to Parkinson’s. Besides, most of us are really nice people to be with. So how do you find your Parkinsons community? Start by finding someone else with PD to talk to. It really helps. While your spouse, significant other or best friend may be there for you, they don’t — they can’t — really understand how you feel. You need to find someone who is living well with PD who can be an inspiration to you. If you can’t find anyone, ask your doctor to put you in touch with another patient who is open to talking to you. Go online. There are a lot of Parkinson’s blogs out there with many different points of view. Find the ones that “speak to you” and follow them. Don’t be afraid to ask questions. Most bloggers welcome the opportunity to interact with their readers. Just beware of those that promise you the moon. As of today, there is NO cure, but scientists seem to be getting closer so don’t’ give up hope. There are also PD communities online where you can participate in chat rooms and conversations with people from all over the world. The best thing to do is to join a support group or attend exercise classes that are specifically for PwP’s. There are dancing classes, boxing for PD programs, yoga, and much more. Once you start going to the classes, you will find that the camaraderie in class is as beneficial to you as the exercise you are getting. If there are no classes in your area, find someone qualified to lead a class for PwPs and start one. You will be helping others and creating your own community at the same time. Some of my best friends have Parkinson’s. We found each other through our PD community. And best of all, when we are together, no one has to hide their symptoms and we have the freedom to just be ourselves. I’ve definitely been doing “the hand thing”. Thanks for the advice on finding a community.